해발 232m의 산성봉 정상일대를 돌로 쌓은 성으로 서낭산에 있어 서낭산성이라고도 불리운다. 대부분 무너졌으나 둘레 2,6㎞, 높이 1m 정도가 남아있다. 『삼국사기』에 의하면 신라가 낙동강을 통해 침입하는 왜구를 막기 위해 양산에 성을 쌓았다는 기록이 있다. 이러한 기록과 성 안에서 신라 토기조각이 발견되는 점으로 보아 신라시대에 축성된 것으로 보고있다. 성의 남쪽에는 이 산성과 규모가 비슷한 북부동산성이 있어 쌍성의 형태를 이룬다. 서낭산에는 양산 부부총으로 유명한 6세기경의 신기리 무덤들이 흩어져 있어 이 일대가 신라시대의 중요한 곳으로 여겨진다. 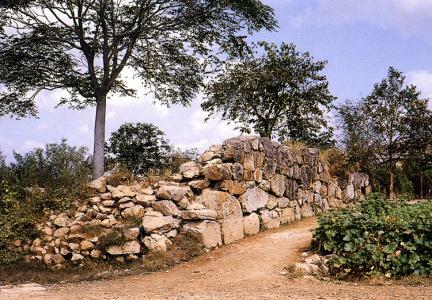 This is a fortress wall piled up with stones around the top of Sanseong Mountain 232m above sea level. Because it is located in Seonangsan Mountain, it is also called Seonangsanseong. Most of the wall has collapsed, so only the wall with the circumference spanning 2600m and height of 1m remains. According to Kim Bu-sik's Samguk sagi (History of the Three Kingdoms), the following record says that the Silla made a fortress wall in Yangsan Mountain in order to prevent invasion by the Japanese pirates through the Nakdonggang River. 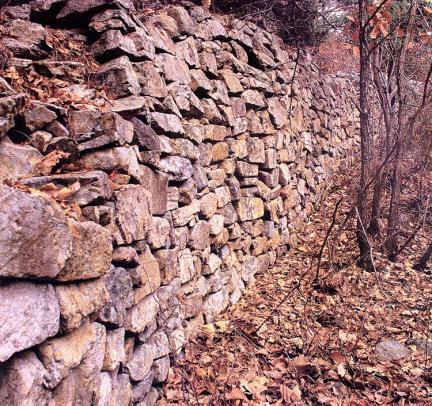 Judging from the record and the pieces of the Silla's pottery, it is considered to be a wall built in the Silla Era. Since the Bukbudongsanseong Fortress located in the South of this fortress is similar in the scale, it had the form of twin walls. The group of tombs of the Silla Era, that was made in around the 6th century and well known as Bubuchong, is scattered; it is considered as an important source of historic knowledge on the Silla Period.